Joe Biden: I'm a Leftist, I Promise! As the race to the far left of the Democrat Party continues, former Vice President Joe Biden is trying to reassure potential primary voters he isn't the moderate people have made him out to be. "We need a little bit more of the Delaware way. We've got to make it more of the American way. It's lost. Our politics have become so mean. So petty. So vicious. We can't govern ourselves. In many cases talk to one another. It can't go on like this folks," Biden told a group of Delaware Democrats over the weekend. "I'm told I get criticized by the New Left, butI have the most progressive record of anybody running for the United [States presidency)... anybody who would run." 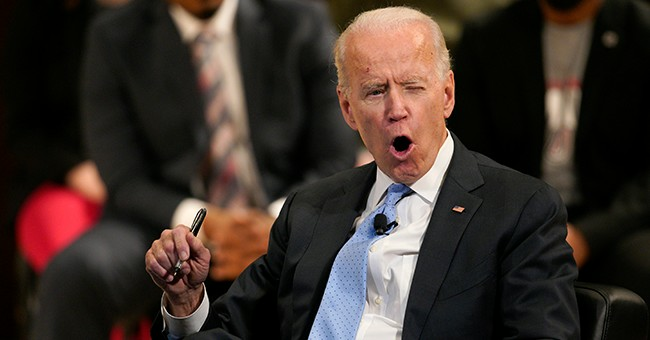 During his remarks, Biden all but gave away his plans to jump into the 2020 Democrat primary. When he does, during the first or second weekend of April, he'll reportedly be campaigining on "optimism." A few weeks ago, Biden dared to call Vice President Mike Pence a good man and was destroyed by the base of the Democrat Party for doing so. After the blow back, he condemned Pence as a religious bigot. For all the talk Biden gives about civility, his record on the issue shows otherwise. During the 2012 presidential camapaign, Biden claimed Republicans would put black Americans "back in chains" if Mitt Romney were to win the White House. Spare us the lectures, Joe.